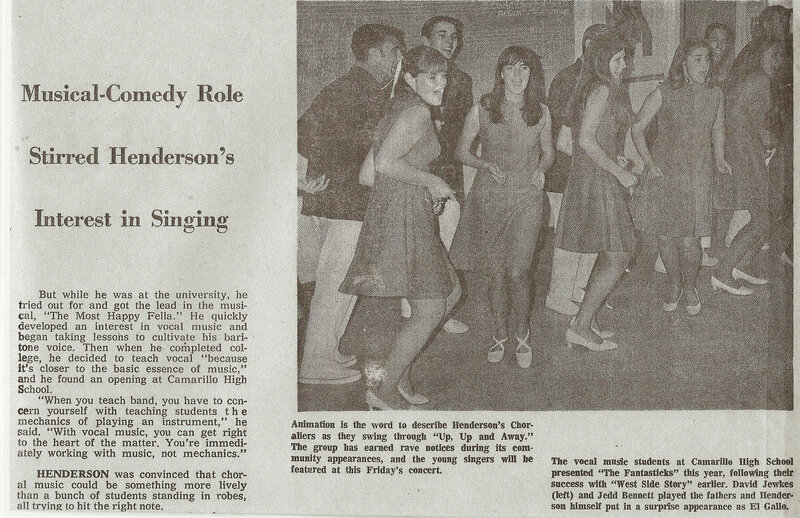 Mr. Henderson had the idea to form a group designed to perform popular songs – with choreography yet. Many music students from the concert choir as well as the Girls Ensemble tried out and The Choraliers were born. Now, in addition to practicing during choir class, we stayed after school, or went into the music room during lunch hour and practiced a whole different style of singing. In the beginning the choreography was mostly from Mr. Henderson’s imagination. Some of it was pretty good, some pretty corny. But it was a nice touch. Something fresh and new. 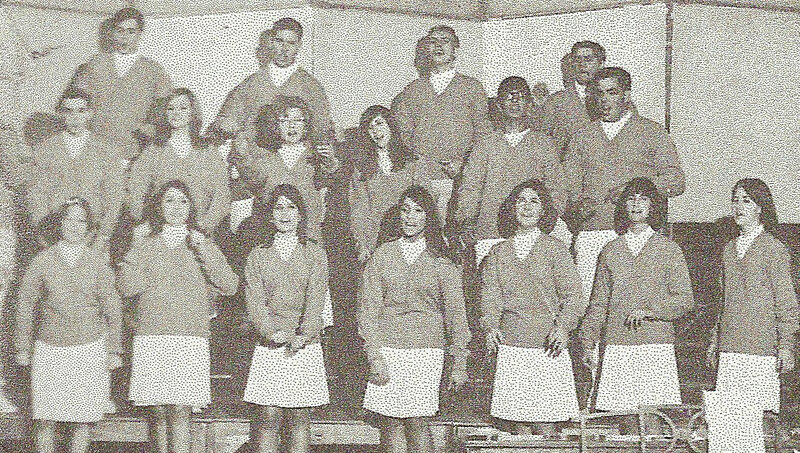 It had never been done before by any singing group at the high school. And of course we had to have costumes. We couldn’t very well perform groovy songs with choreography in our choir robes! Our first outfits were white bottoms (pleated skirts for the girls, slacks for the boys), light blue sweaters and red dickies. (Everytime Mr. Henderson said the word “dickie” we would burst out laughing). The school audiences liked the Choraliers! And so did other audiences. We began to perform for local organizations and small events. 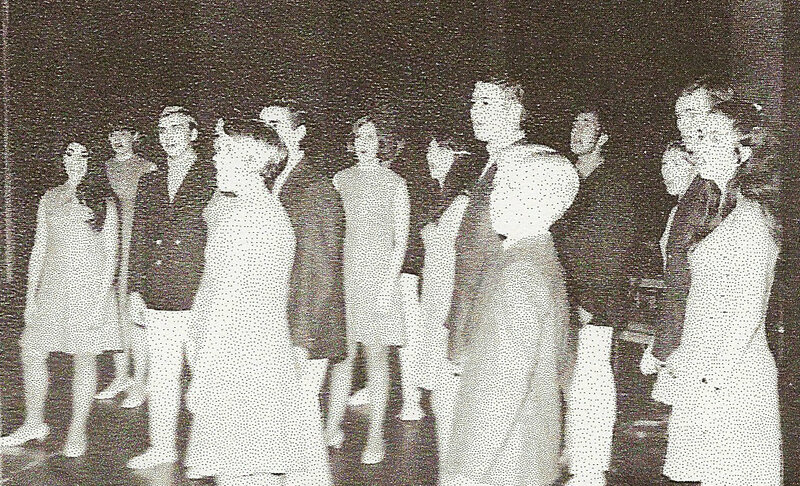 Many weekdays, after the high school was quiet except for the athletic teams out on the field, the music room was popping with activity. We began to learn to move while singing; to project; to smile and relate to the audience; to invite them into our happy world for a while. As the Choraliers began performing around town we got noticed. 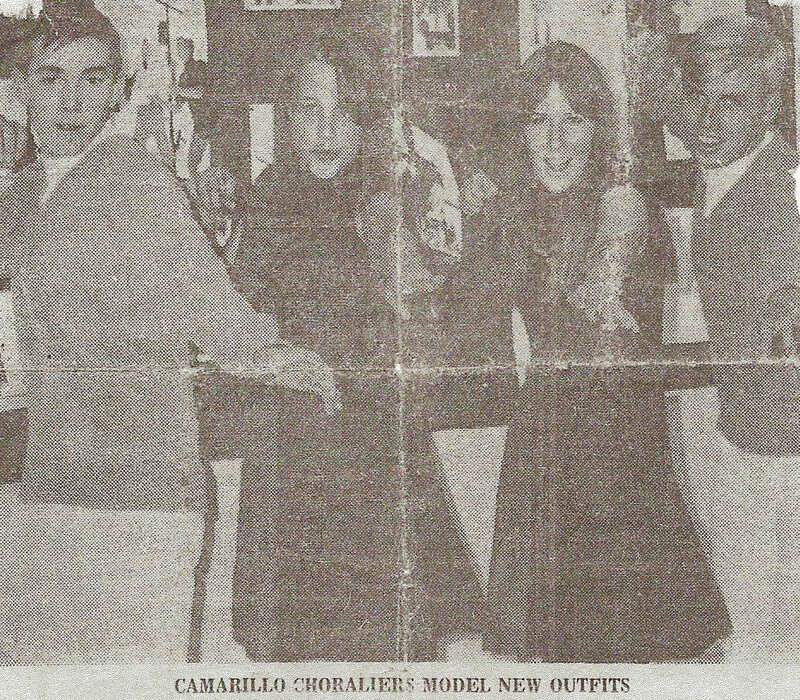 We were soon appearing in the Camarillo Daily News with amazing frequency. Eventually, the girls graduated to a unique dress that was red on one side and blue on the other. 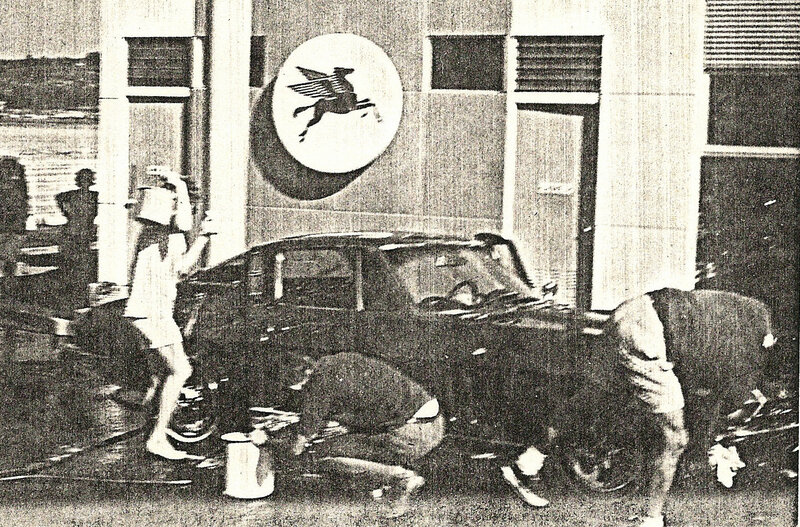 It was designed by a Hollywood studio costume designer that lived in Camarillo – Violet Palmer. I don’t know if she volunteered or if Mr. Henderson cajoled, but it was the first of two wonderful costumes that she designed for us. Our new outfits rated an article in the paper. Leaders of the town loved us. We were in parades, and performed at every local businessman’s club around. Then we expanded outward and started getting bigger and better gigs. I don’t know how he did it, but Mr. Henderson managed to talk the administration into allowing the Choraliers to be a regular class in the school schedule. 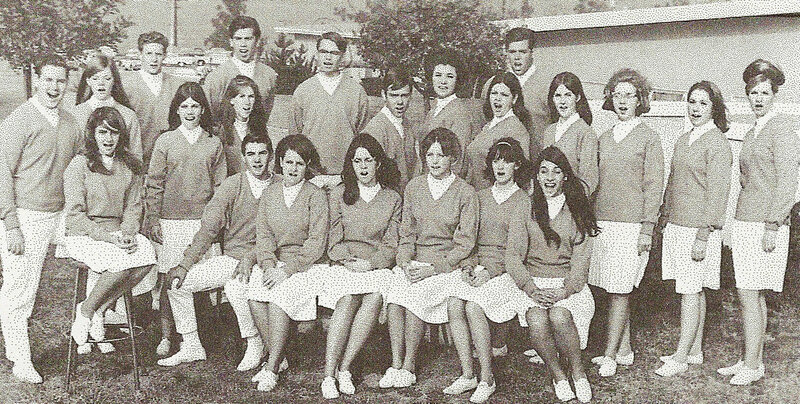 What started out as Madrigal class in the fall of 1967 morphed (although that word did not exist then) into Choraliers class and we got down to serious work and serious fun. 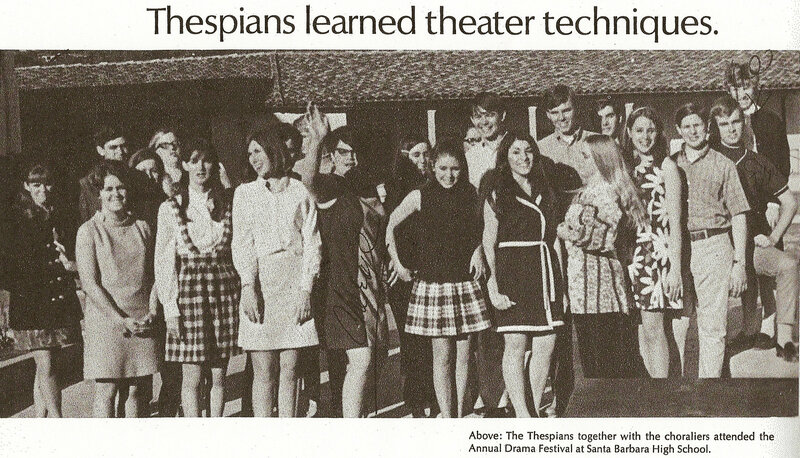 This meant that we could actually use class time to practice…in ADDITION to lunch hour and after school! It would be difficult to top West Side Story so he didn’t even try. Mr. Henderson’s idea for a musical this year was a small workshop production, The Fantasticks, produced entirely by the Choraliers class. Every member would be involved – as actors, stage crew, make up, set designers, lighting, publicity, whatever. Once again, Dennis Wilkerson came to our aid with his multiple talents. He did the stage direction and supervised the efforts of all the members of the class as we attempted a professional-caliber production. We also continued to perform for events, as well as prepare for concerts. 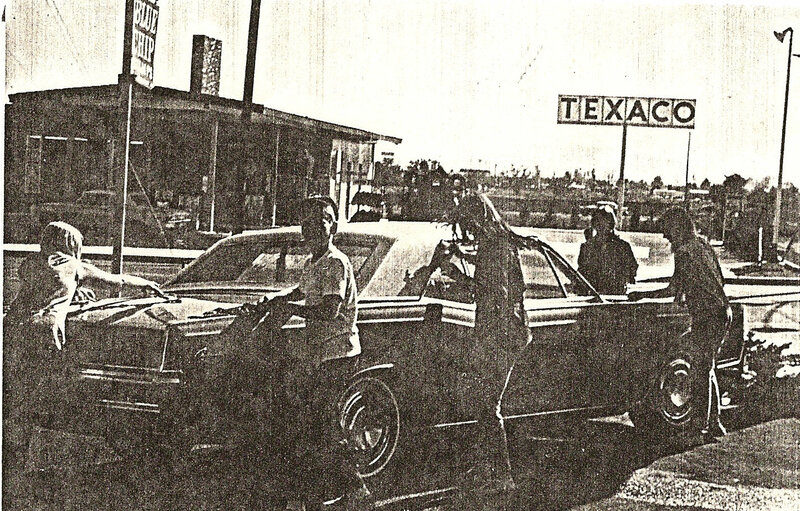 And of course there were the necessary fund-raisers….spaghetti dinners, pancake breakfasts and car washes. 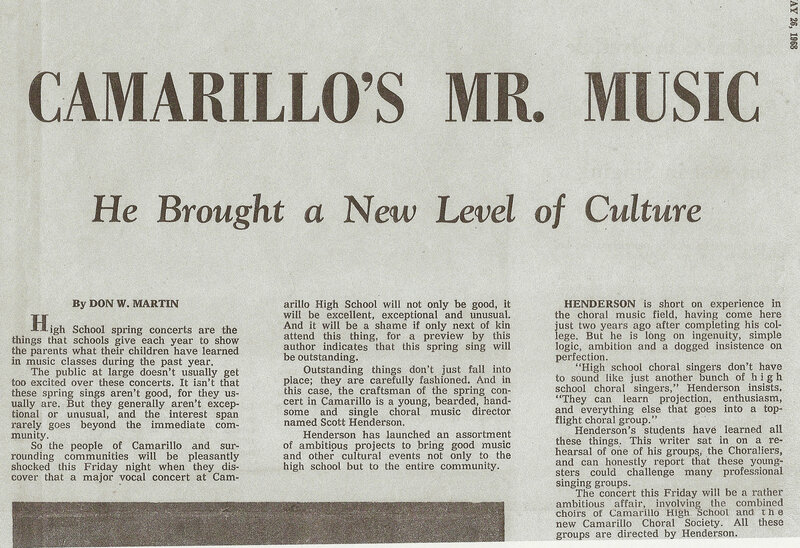 Mr. Henderson wanted to expose us to many different musical and artistic expressions, and in 1967 and 1968 we often spent our weekends attending concerts, musicals and events, such as an Andy Williams & Henry Mancini concert, Camelot, Oklahoma!, and a drama festival in Santa Barbara. 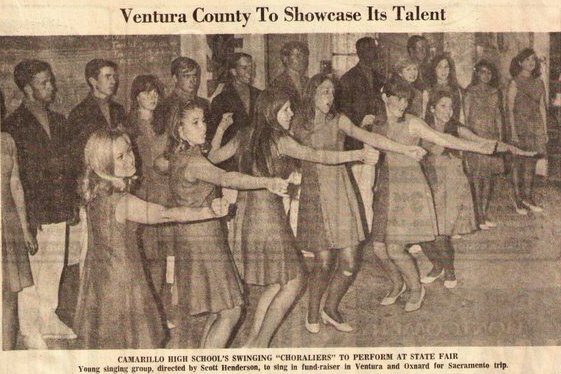 We also sponsored events for Camarillo that fulfilled Mr. Henderson’s dream of introducing great music to the community. These included a concert by the University of Arizona Symphonic Choir, and the UCLA’s Opera Workshop production of La Boheme. Unfortunately, these had to be performed in the high school gym, as there was no other appropriate venue in the area. But sound baffles were used, the quality was still excellent, and for most of us, it was our first exposure to opera. 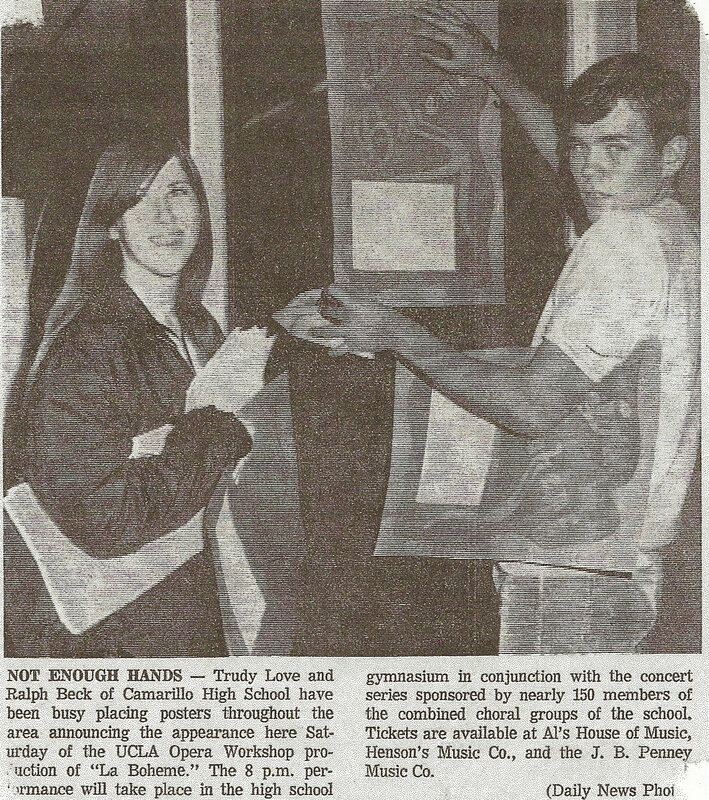 We got an unusual amount of press for an upcoming high school spring concert in May, 1968. Well okay, we shared the spotlight with “Mr. Music” in this spread. Somehow we got invited to sing at the California State Fair in Sacramento as part of Ventura County Day. The day we were to perform in Sacramento was the first day of the senior year of high school for many of us. Two days before we were to leave we still weren’t sure how we were going to get to Sacramento. A bus had been arranged with volunteer drivers, but at the last minute the drivers were no longer available. Another bus was appropriated but did not pass the safety check. In my minds eye I can see Mr. Henderson on the phone trying to get parents to drive, or calling people desperately to finance bus tickets to Sacramento. At any rate, quite late the evening before we were to perform we each got a call that the trip was canceled. Even the great Mr. Henderson couldn’t pull this one off. Wait! ….What am I saying? The morning of our first day back at school, when we probably should have been mentally gearing up for another academic year, we arrived at school with our heads hanging low. Then mid-morning we somehow all got the word – we WERE going!! David Jewkes’ father had come through! 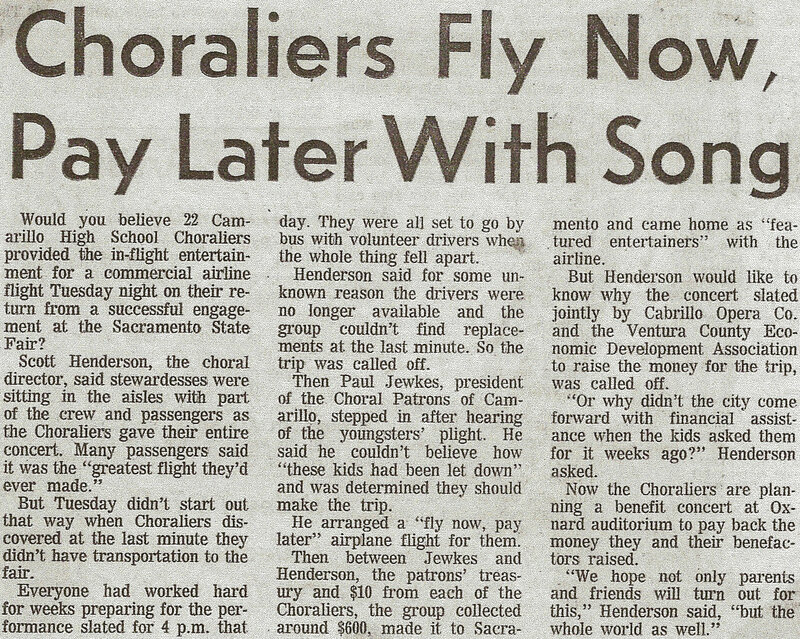 With funds from a few “anonymous donors”, the entire contents of the treasury of the Choral Patrons of Camarillo and a $10 contribution by each Choralier, airline tickets were purchased for all of us and we were flying to Sacramento! Our first day back at school turned into a whirlwind of activity as we somehow managed to get to our homes, get our costumes, get back to school, get down to LAX, board a plane (for the first time for most of us), fly to Sacramento, get to the state fair, find our performance location and perform (along with a very tipsy Jerry Van Dyke), get back to the airport and fly home. “Would you believe 22 Camarillo High School Choraliers provided the in-flight entertainment for a commercial airline flight Tuesday night on their return from a successful engagement at the Sacramento State Fair? Talk about a busy first day back at school! 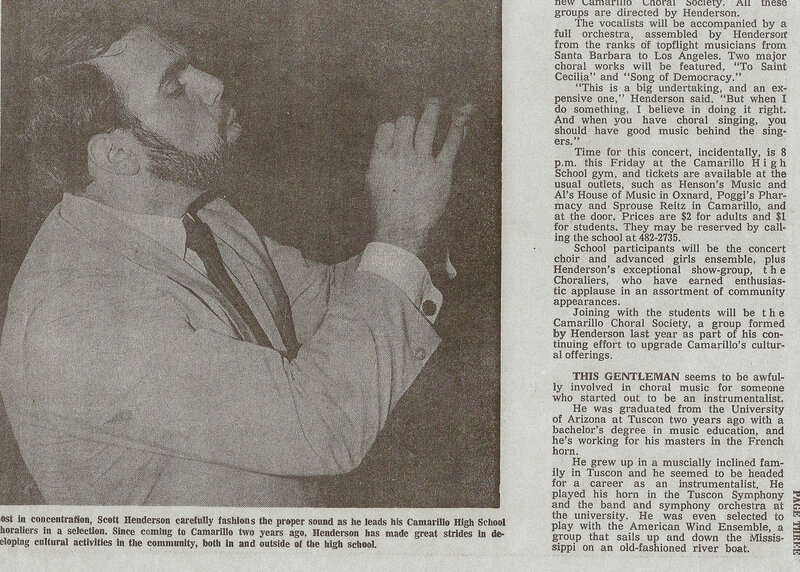 As I look back now, I can visualize steam coming out the ears of the administrators of good ol’ Camarillo High. But it was certainly the best, most memorable first day of school I’ve ever had! And the most exciting and important performance yet for the Choraliers. There were always issues with money. Never enough to cover the cost of putting on the calibre of performance that Mr. Henderson demanded. 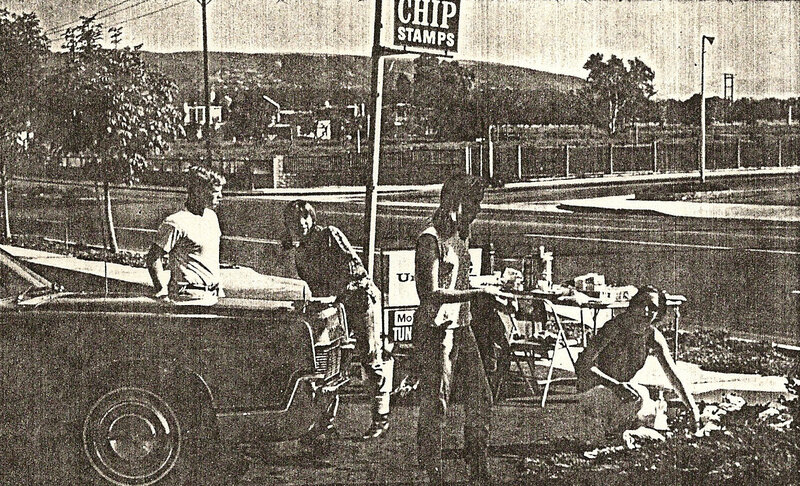 So we were either fund raising with pancake breakfasts, spaghetti dinners and car washes, or we were putting on “benefit concerts” (which inevitably cost even more than was raised.) As a kid, I didn’t care about all that stuff. I was just having such a great time, spending most of my time doing what I loved the most – hanging out with friends, and singing! The Choraliers had two distinct parts to our performances: current popular songs were performed in our groovy new outfits, and songs from musicals were performed in costumes. Several years ago, I ran into Jerry Van Dyke and we talked for a few moments. I told him I hadn’t seen him since “we performed together at the state fair in ’68”. OK, a slight exaggeration but held his attention. He said he remembered the kids in the red, white and blue outfits and that we were good. I said that was us. Cool, we left a real good impression. During a production of SHOW BOAT at The Lawrence Welk Resort (I recommend it as a nice relaxation spot) in Escondido, I thanked Arthur Duncan for his performance with us and for being a nice guy to us. He also remembered the show, how good we were and the audience response.